Bunneh: Lemme wipe those crumbs off your face. OK, time for an N-A-P.
is it a bunny or anowl? anowl would eat the little chix. The duckling in that second pic looks totally fake, though I'm sure it's real. So cute! The bunneh looks extremely disapproving in the last pic. I want to gently chomp that bunnose. So prosh. Mr. Bebehsittah has the Neverending Story-esque eartufts. and here I thought Buns was for eating... silly me...they are obviously duckherders of the finest kind..
Holy crap - bunny AND ducky love! OH that bun's fur looks SO delightful! I just want to bury my nose in it! 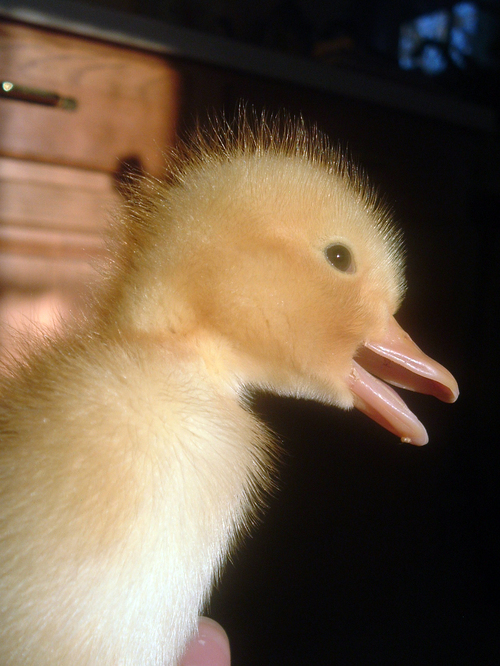 The duckehs are super cute too, all that feathery down and bun fluff is heavenly. I love the way the behbehsitter hops to his/her tour of duty! Bunny bombalina soon makes light work of her Ducky behbehs. Its all down to our training, be firm but fair, she simpers. They are so perfect looking that it looks fake. The sweetest thing I have ever seen. Trying to figure out though how the bunny got in the little hole in the 3rd picture. I have turned to moosh. 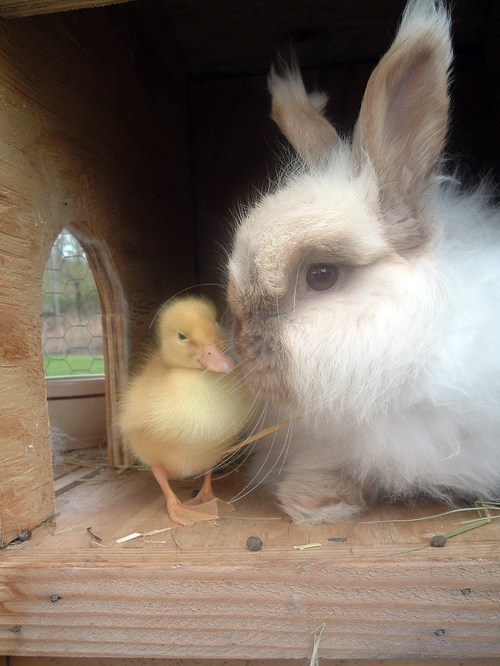 It's like Glamor Shots for bunnehs and duckies. Is it just me or does the babysitter look like Cybil Shepherd? this must be the happiest place on earth. and whoever owns this back yard is the luckiest person on earth. I jes 'sploded. Don't you wish people could accept and watch out for each other like critters do???? That bunneh looks like a professor I had once... old and wise. Teachin DA chickees how to grow up right... just like that golden retriever with the ADORABLE little kitteh and the sunbeam in a previous post!! The fuzz! So soft, so tickly! I can barely resist the urge to snorgle my screen, but I know that won't feel the same. Beautiful pictures and great storytellering! Sigh... I. am. DED. It's like an Easter fluff buffet!!! the duckee's hair in 2cnd pic looks static-eeee. 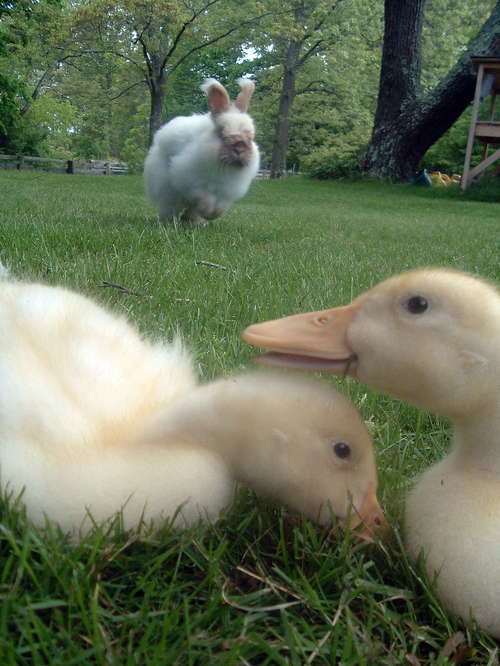 Bunny stampede through baby ducks--too much! It's like a little fluffy fairy tale. Anyone else notice that the tufts of fur on the bunny's ears are flowing back in the breeze? Too cute! Does this place and these animals really exist. I'm closing my eyes tapping my flip flops together and I'll be in bunny ducky land. pic 3 just blew me away! What a beautiful bun! He has lovely fur, like an angora sweater. This is like a picture from a happy little golden book. The little duckling I think it was called. oh my. i am slayed by the fluff, killed by the qte! this is a magical, magical dreamland. are there unicorns barfing rainbows just out of the frame? what do i have to type into mapquest to get me there? Wow, it's like Holly Hunter followed up her Thanksgiving movie with one about Easter for Animal Planet. Teho, is it SOFT FOCUS or FLOOFULENCE? Too cute. Am I the only one who initially thought this was a Persian kitteh stuffed in a bunny suit? Red Rover, Red Rover, fuzzy bunny come over! sigh - you've done it ONCE again - I'm in tears. Stop with the floofiness already - I'm going to have to take my business to meanhorriblethingsoverload.com if you're going to keep making me cray. The pics are VERY cute. It's the glorious marriage of bawn floff to duq featherfloof. May they live fluffily ever after. Alas, the origin of Cadbury eggs is revealed. The first picture almost looks threatening, like "The Attack of the Bunny Brigade", but the other two are just too sweet and charming for words. That's some rabbit! 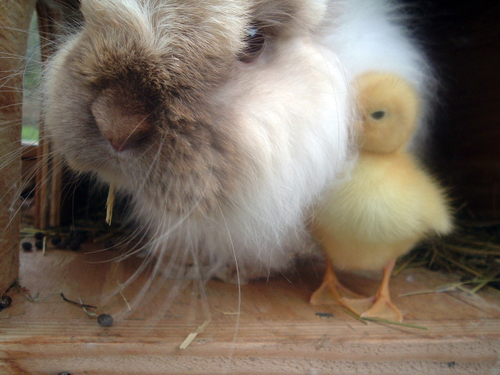 even the ducky in the last photo knows to snorggel the soft bunny fluffs! You can't even see his beak it's so deep in the fluffiness! Soo cuddly, really anything with a bunny looks cuddly! I love how the ducky's standing on its own feet in the 3rd picture.